The asymmetric synthesis of a Rho kinase/norepinephrine transport inhibitor, netarsudil, the active component in the recently FDA-approved product Rhopressa™, is described herein. This concise six-step synthetic route utilizes the 2,4-dimethylbenzoate ester of a phenylacetic acid as the backbone of the β-amino acid’s framework. A chiral enolate of the Evans auxiliary, (R)-4-benzyloxazolidin-2-one, is used to direct the formation of the (S)-stereocenter by incorporating the N-Boc-protected β-amino methyl arm with high diastereoselectivity (96:4 dr) using N-Boc-1-aminomethylbenzotriazole as the electrophile. Uniquely, 2,2,2-trichloro-1,1-dimethylethyl chloroformate is used as a non-racemizing activating agent for the coupling reaction between the chiral (S)-N-Boc-protected 2,4-dimethylbenzoyloxymethyl phenyl propanoic acid and 6-aminoisoquinoline to provide N-Boc-protected netarsudil in good yield and excellent enantiomeric purity (63%, 98% ee). 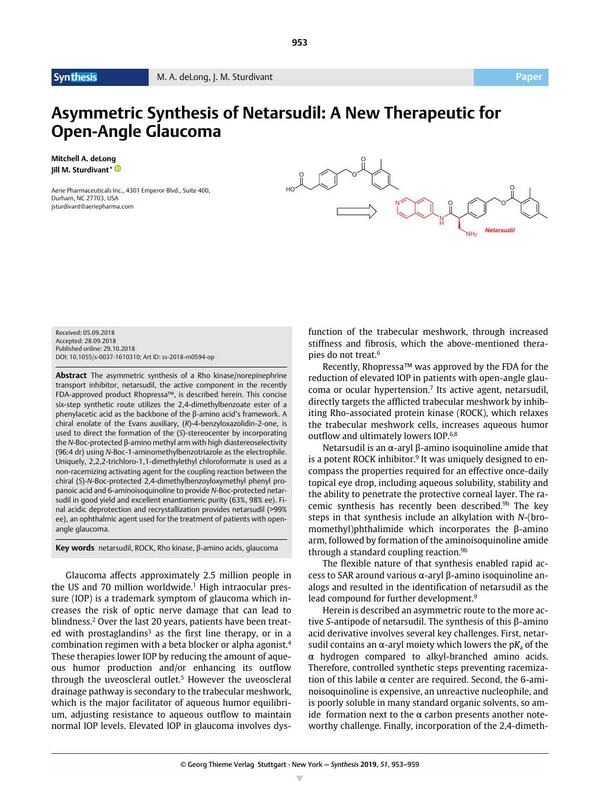 Final acidic deprotection and recrystallization provides netarsudil (>99% ee), an ophthalmic agent used for the treatment of patients with open-angle glaucoma. Supporting information for this article is available online at https://doi.org/10.1055/s-0037-1610310. 17a Diastereomeric ratio (dr) was determined by isolation of each diastereomer. 17b Enantiomeric excess (ee) was determined by chiral LC. 18d HATU = 1-[Bis(dimethylamino)methylene]-1H-1,2,3-triazolo[4,5-b]pyridinium 3-Oxide Hexafluorophosphate; HOAT = 1-Hydroxy-7-azabenzotriazole; DMAP = 4-Dimethylaminopyridine; EDC = N-(3-Dimethylaminopropyl)-N-ethylcarbodiimide hydrochloride; HOBT = 1-Hydroxybenzotriazole hydrate; DCC = N,N-Dicyclohexylcarbodiimide; PyAOP = (7-Azabenzotriazol-1-yloxy)tripyrrolidinophosphonium hexafluorophosphate; DIEA = Diisopropylethylamine, DMTMM = 4-(4,6-Dimethoxy-1,3,5-triazin-2-yl)-4-methylmorpholinium chloride; CDI = 1,1-Carbonyldiimidazole.